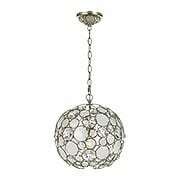 This Palla Collection pendant injects a light-hearted note into any space. Fashioned from delicate iron rods, the shade is bursting with "bubbles", each fitted with sparkling Swarovski crystals and iridescent Capiz shells. Finished with a lustrous silver leaf, it casts a bright and cheerful light that's perfect for your dining room, foyer, or living room. 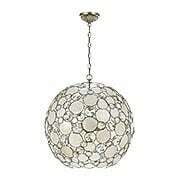 This Palla Collection pendant injects a light-hearted note into any space. Fashioned from delicate iron rods, the shade is bursting with "bubbles", each fitted with sparkling Swarovski crystals and iridescent Capiz shells. Finished with a lustrous silver leaf, it casts a bright and cheerful light that's perfect for your hall, foyer, or kitchen island. This Palla Collection flush mount injects a light-hearted note into any space. Fashioned from delicate iron rods, the shade is bursting with "bubbles", each fitted with sparkling Swarovski crystals and iridescent Capiz shells. Finished with a lustrous silver leaf, it casts a bright and cheerful light that's perfect for your bedroom, hall or foyer. This traditionally styled Cut Crystal 1-Light Wall Sconce is composed of 24-percent lead crystal, and features a white candle sleeves and a polished-chrome finish. This traditionally styled Cut Crystal 2-Light Wall Sconce is composed of 24-percent lead crystal, and features a white candle sleeves and a polished-chrome finish. This traditionally styled Cut Crystal 3-Light Wall Sconce is composed of 24-percent lead crystal, and features a white candle sleeves and a polished-chrome finish. 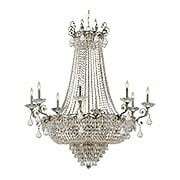 This traditionally styled Cut Crystal 12-Light Chandelier is composed of 24-percent lead crystal, and features white candle sleeves and a polished-chrome frame. 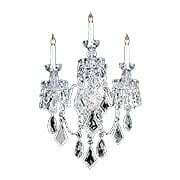 This elegant flush mount features a gorgeous shade of 24% lead crystal and finely detailed chrome accents. Illuminated from within, it provides a brilliant and sparkling light - perfect for your bedroom, foyer or powder room. 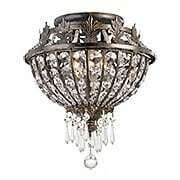 This elegant flush mount features a gorgeous shade of 24% lead crystal and finely detailed brass accents. 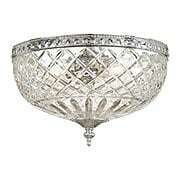 Illuminated from within, it provides a brilliant and sparkling light - perfect for your bedroom, foyer or powder room. 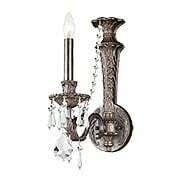 This Majestic Collection sconce is the piece de resistance of any formal interior. Draped with strands of dazzling hand cut crystals, it is brilliantly lit from within. The neo-classical body is finely cast from solid brass, the details highlighted with a "historic" finish (lightly antiqued and burnished). 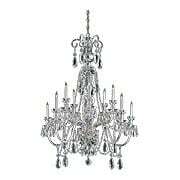 Pair with the matching Majestic chandeliers or ceiling lights for a truly splendid effect. 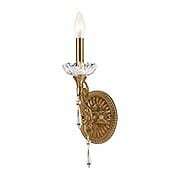 This Majestic Collection sconce is elegant addition to any formal interior. 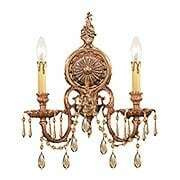 The neo-classical body is finely cast from solid brass, the details highlighted with a "historic" finish (lightly antiqued and burnished) and hand-cut crystal accents. 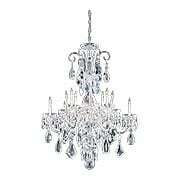 Pair with the matching Majestic chandeliers or ceiling lights for a truly splendid effect. This Majestic Collection ceiling light is the piece de resistance of any formal interior. Draped with strands of dazzling hand cut crystals, it is brilliantly lit from within. The neo-classical body is finely cast from solid brass, the details highlighted with a "historic" finish (lightly antiqued and burnished). A splendid choice for your entry, bedroom or hall. This Majestic Collection ceiling light is the piece de resistance of any formal interior. Draped with strands of dazzling hand cut crystals, it is brilliantly lit from within. The neo-classical body is finely cast from solid brass, the details highlighted with a "historic" finish (lightly antiqued and burnished). A splendid choice for your living room, master bed room or foyer. 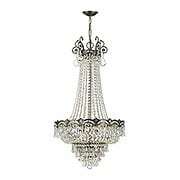 This Majestic Collection chandelier is the piece de resistance of any formal interior. Draped with strands of dazzling hand cut crystals, it is brilliantly lit from within. The neo-classical body is finely cast from solid brass, the details highlighted with a "historic" finish (lightly antiqued and burnished). A splendid choice for your dining room, living room or foyer. 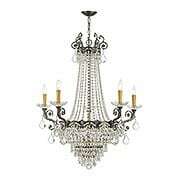 This Majestic Collection chandelier is the piece de resistance of any formal interior. Draped with strands of dazzling hand cut crystals, it is brilliantly lit from within. The neo-classical body is finely cast from solid brass, the details highlighted with a "historic" finish (lightly antiqued and burnished). A splendid choice for your dining room or foyer. Our Novella Collection two light sconce captures the flavor of late 19th century Italian lighting. The ornate, neo-baroque design is beautifully crafted from solid brass and draped with hand-cut, golden teak crystals. Dripping candle sleeves and a subtle patina finish complete the old world look. You don't need high ceilings to enjoy the beauty of a crystal chandelier. 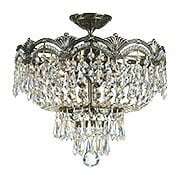 This elegant Maria Theresa style flush mount is less than 12" high, yet features dozens of gorgeous hand cut crystals and a beautifully sculpted canopy. 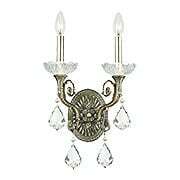 The clear crystal carriage is laced with brass, which is finished in gleaming gold or polished chrome. Lit from within by three candelabra bulbs, it sets your room ablaze with light! 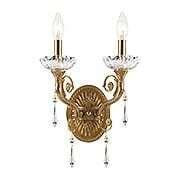 This traditional Maria Theresa sconce is a perennial favorite. 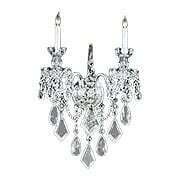 Draped with dozens of hand cut crystals, it sparkles and shines with three candle lights. 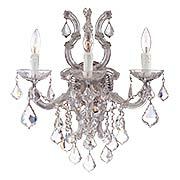 The clear crystal carriage is laced with brass, which is finished in polished chrome. 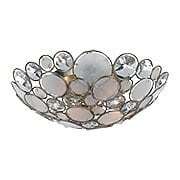 More than 20" high, it makes a substantial statement in your living room, dining room, foyer or bedroom! 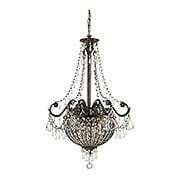 This traditional Maria Theresa chandelier is a perennial favorite. Draped with hundreds of hand cut and polished crystals, it sparkles and shines with six candle lights (five arms and one in the center). 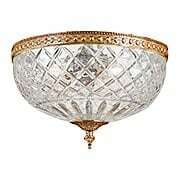 The clear crystal carriage is laced with brass, which is finished in gleaming gold or polished chrome. Only 23" wide, it's perfect for your living room, dining room, foyer or bedroom! You don't need high ceilings to enjoy the beauty of a crystal chandelier. 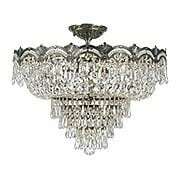 This elegant Maria Theresa style flush mount is less than 12" high, yet features hundreds of gorgeous hand cut crystals and a beautifully sculpted canopy. 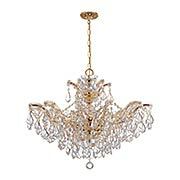 The clear crystal carriage is laced with brass, which is finished in gleaming gold or polished chrome. Lit from within by five candelabra bulbs, it sets your room ablaze with light! You don't need high ceilings to enjoy the beauty of a crystal chandelier. This elegant Maria Theresa style chandelier is only 20" high, yet features hundreds of gorgeous hand cut crystals and a beautifully sculpted canopy. 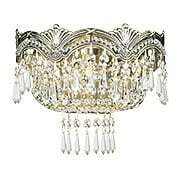 The clear crystal carriage is laced with brass, which is finished in gleaming gold or polished chrome. Lit from within by six candelabra bulbs, it sets your room ablaze with light! Fixture is convertible for flush or suspended mounting. 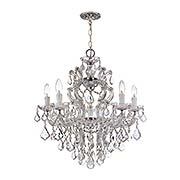 This traditionally styled Cut Crystal 10-Light Chandelier is composed of 24-percent lead crystal in a variety of classic shapes and sizes. It features white candle sleeves and a polished chrome frame. Exquisite brass castings accented with dazzling hand-cut lead crystals make the Regal Collection a splendid addition to your home. 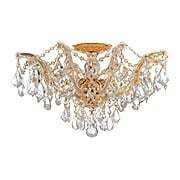 Featuring a golden candle and crystal bobeche, this substantial sconce sparkles and shines with the utmost elegance. Pair with the matching Regal chandeliers or ceiling lights for a truly splendid effect. Exquisite brass castings accented with dazzling hand-cut lead crystals make the Regal Collection a splendid addition to your home. 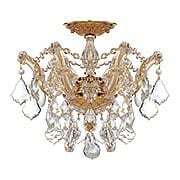 Featuring golden candles and crystal bobeches, this substantial sconce sparkles and shines with the utmost elegance. Pair with the matching Regal chandeliers or ceiling lights for a truly splendid effect. Inspired by French iron fixtures of the late 19th century, this Sconce offers the ultimate in European elegance. The intricate cast iron elements are finished with an antique bronze patina and draped with brilliant lead crystals of many sizes and shapes. Dazzling from any angle, these chandeliers, sconces and pendants are sure to be the focal point your decor. 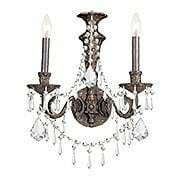 Inspired by French iron fixtures of the late 19th century, this Double Sconce offers the ultimate in European elegance. The intricate cast iron elements are finished with an antique bronze patina and draped with brilliant lead crystals of many sizes and shapes. Dazzling from any angle, these chandeliers, sconces and pendants are sure to be the focal point your decor. Inspired by French iron fixtures of the late 19th century, this Small Ceiling Light offers the ultimate in European elegance. The intricate cast iron elements are finished with an antique bronze patina and draped with brilliant lead crystals of many sizes and shapes. Dazzling from any angle, these chandeliers, sconces and pendants are sure to be the focal point your decor. Inspired by French iron fixtures of the late 19th century, this Pendant / Chandelier offers the ultimate in European elegance. The intricate cast iron elements are finished with an antique bronze patina and draped with brilliant lead crystals of many sizes and shapes. 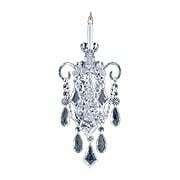 Dazzling from any angle, these chandeliers, sconces and pendants are sure to be the focal point your decor.